Traveling the Book: Teaching Deep Research in 200-Level Online Literature Courses | Hey, Mrs. Winkler! Imaginary portrait of Eliza Wharton, the tragic heroine of Hannah Webster Foster’s 18th Century American novel–The Coquette. I have been teaching 200-level literature classes for some time now, having developed three from the ground up–World Literature II, British Literature I and British Literature II. This summer I’m working on my fourth online literature course, American Literature I. Now that the state has for some ungodly reason pronounced only American Literature I and II as universally transferrable, there is more demand for American literature than British, which is ridiculous to me since our language as well as many of our ideas and values originated in jolly old England. But that is a topic for another post. The assignment has been made up of two parts: An annotated bibliography of sources about the author and his or her work and an itinerary of a two-week literary tour, including a summary or description of the work and a daily itinerary of places in the modern world people can visit that are related to the book and/or author. Students must also include an itemized budget, explaining how they will spend an imaginary $10,000 dollars, not including air fare, on accommodations, food, travel, entrance fees and miscellaneous cost. For American Literature I, I am asking students to also include a timeline of important events in American history as they relate to the author and/or work. I have learned a great deal over the years about what works and doesn’t work concerning this assignment and continually refine it to help students reach the goals of the project which include coming to a better understanding of a major work of literature and its author, of course, but perhaps more importantly, learning how to pursue the deeper, more significant research they will hopefully be expected to conduct when they transfer to a four-year college. One of the things I have learned is that students don’t really understand how to do deep research, so they have a hard time grasping the requirements of the project, so clear directions on completion are essential. I also limit the number of sources students can locate using simple web searches, encouraging instead the use of scholarly databases, e-books and print sources. I also disconnect the sources used to find general travel information from the annotated bibliography, which should be more scholarly in nature. I have just completed the annotated bibliography sample for American Literature I. The novel I chose is The Coquette, an epistolary novel by Eighteenth Century writer Hannah Webster Foster, and is considered to be the first American novel written by a woman. I will be adding the required summary of the novel before I actually post the example, but here are the ten required sources and their annotations to give readers an idea of what this part of the project looks like. When I finish it, I will post the travel itinerary presentation example. Brown, Richard D. “Daughters, Wives, Mothers: Domestic Roles and the Mastery of Affective Information.” Knowledge Is Power: The Diffusion of Information in Early America, 1700-1865. Cary, NC, USA: Oxford University Press,1991:160 196. ProQuest ebrary. Web. 27 May 2015. Chapter Seven discusses the role of women in Early American society and the importance of Bostonian women’s importance to the publishing industry, especially newspapers, as well as the growing importance of novels, such as The Coquette. Although this source doesn’t mention Hannah Webster Foster or Elizabeth Whitman directly, it does have a wealth of information about the role of women in the time period when Foster lived and wrote. In addition, I have found that Foster’s first publications were political articles in Boston newspapers and that the first newspapers in America were printed in Boston. There are several interesting aspects of the chapter that make Brown’s book relevant to my itinerary, especially a discussion on life as an upper class woman in 18th Century, particularly the life of Mary Holyoke of Salem, who kept a detailed diary of her social, political and domestic concerns as the wife of a prominent man in society. The woman described sounds very much like Eliza Wharton, the heroine of the novel. Other interesting information in the chapter is the importance of newspapers to women in all levels of society, the sensational nature of much of the newspaper reporting and how the patriarchal society of America attempted to suppress the reading of novels. Davidson, Cathy N. “Hannah Webster Foster.” American Writers of the Early Republic. Ed. Emory Elliott. Detroit: Gale, 1985. Dictionary of Literary Biography Vol. 37. Literature Resource Center. Web. 26 May 2015. A short biography of Hannah Webster Foster and a critique of The Coquette, which yields some interesting information about Foster and Elizabeth Whitman, the woman on whom Foster modeled her heroine. The author lived her whole life in Massachusetts, first in Salisbury and then in Brighton after she married John Foster, who became the minister of the First Church in Brighton, Mass. She had six children with Foster. Her first novel of two, The Coquette, was published in 1797 after the birth of her first child. This article mentions, as have other biographies, how Foster moved to live in Montreal with two of her daughters, both writers in their own rights, following her husband’s death, although I am not sure if I will include Montreal in my itinerary, which will probably include locations in Massachusetts and Connecticut only. The article also offers a critique and analysis of The Coquette, and interesting to my purposes, also posits that Pierrepont Edwards, the son of the important “Great Awakening” preacher, Jonathan Edwards, was the father of Elizabeth Whitman’s child and the model for Major Sanford in Foster’s novel, convincing me to do some research on Jonathan Edwards and Pierrepont’s situation and perhaps add some relevant locations to my trip. “Elizabeth Whitman: The Mysterious Coquette of 1788.” New England Historical Society. WordPress, 2014. Web. 25 May 2015. Speculates on the life and loves of Elizabeth Whitman, the real-life Eliza Wharton from Foster’s novel, The Coquette. Not only gives some background on Whitman, but also speculates on her suitors and the men who possibly fathered her child, including Pierrepont Edwards, the philandering son of Jonathan Edwards, the firebrand preacher central to the Eighteenth Century’s Great Awakening, a protestant spiritual revival. Edwards lived In New Haven, a town that Whitman frequented. Another reason to visit New Haven is that many of the letters written by Eliza Wharton in Foster’s epistolary novel are penned in New Haven. Other possible models for the character of Major Sanford, the seducer in the novel, are U.S. Senator James Watson and even, Aaron Burr, who became the third Vice-President of the United States, as well as Timothy Dwight, future president of Yale University, who helped with the cover up after Whitman’s untimely death. Helped me to make up mind to visit Yale as part of my trip. Grove Street Cemetery. Friends of the Grove Street Cemetery, n.d. Web 28 May 2015. A website that gives detailed information on the cemetery in New Haven, Connecticut, where the fictional Eliza Wharton penned most of her letters. Pierrepont Edwards, youngest son of the prominent theologian, Jonathan Edwards, is buried here. Edwards is believed by many to be the model in the novel for Major Sanford, the man who seduced Eliza and abandoned her. In real life Edwards is the most likely candidate to be the one who seduced Elizabeth Whitman, impregnated and then abandoned her. Also, buried in this cemetery is Timothy Dwight, one of the early presidents of Yale, who is also sometimes mentioned in connection to Elizabeth Whitman, either as the seducer himself or one who helped the Edwards’ family cover up the scandal after Whitman’s death. The website gives quite a bit of information about Dwight, all lauding his accomplishments. Nothing, of course, about the scandal. Nevertheless, there is a wealth of information here to help me with my travel plans, including a self-guided tour map, listings of prominent people buried in the cemetery and a short video about the important Revolutionary figures buried at the Grove Street Cemetery. Marchione, Dr. William P, PhD. “Hannah Foster: Brighton’s Pioneer Novelist.” Brighton-Allston Historical Society, 2001. Web. 26 May 2015. Excellent article that gives me actual addresses to places in Brighton Center (a suburb of Boston) related to Hannah Webster Foster. I can plan much of my itinerary for the Brighton leg of the journey from this article. I found that the building (10 Academy Hill Road) where Foster wrote the Coquette, was then the parsonage for the church her husband pastored, but is now in disrepair and a store front, but Dr. Marchione, the author of the article, petitioned to have a plaque put up to commemorate the building’s importance, and the plaque was supposedly erected. I plan to look for myself to see if it is there. In addition, I plan to visit the first residence of John and Hannah Foster, The Ebenezer Smith House on Peaceable Street 15-17, which is still standing, according to the article, and is thought to be the oldest building in the Brighton Center area. The third residence caused some stir in the area as it was a huge, elaborate mansion and some residents thought it inappropriate that a clergyman should build such an expensive and opulently furnished house. Only a portion of the original house stands at 181 Foster Street, so I will plan to visit there. Since I have all of the addresses, I can simply plug them into my GPS and head on out! Olver, Lynne. “Colonial and Early American Fare.” The Food Timeline. Lynne Olver. 1999. Web. 27 May 2015. An important part of any trip I plan is doing my best to order foods that relate to the book I am “traveling.” In this case, The Coquette is about an upper class woman in the 18th Century who lived in Connecticut and Massachusetts, and I found wonderful information at this site. I discovered that popular foods in New England during this time included pies, cakes, chowders, baked beans, roasted meats, breads, salt pork, bacon and ham. I will also keep my eyes out for a special dessert called “Election Cake” and unusual fish choices like Hannah Hill and Black Fish. Because this website breaks down cuisine by time and place, I can very easily pick and choose foods that I will want to keep in mind when looking at menus to plan my trip. In addition, there are interesting cultural tidbits of information on the site as well as a myriad of links to other sites, including the helpful source, American Cookery, which is a facsimile of the first cookbook written by an American. Simmons, Amelia. American Cookery. Hartford: Simeon Butler, 1798. Feeding America: The Historic American Cookbook Project. Michigan State University Libraries. 31 August 2003. E-book. 27 May 2015. American Cookery is the first cookbook written by Americans for Americans and is a great resource to discover what New Englanders were eating during the time Hannah Webster Foster was living. In fact the cookbook was originally published i n 1796, just one year before Foster’s novel, The Coquette. In addition, the book was published in Hartford, Connecticut, which is where the real life Eliza Wharton (Elizabeth Whitman), the tragic heroine of the novel, lived and will be one of the stops on my trip. The cookbook discusses raising, preparing and cooking all manner of dishes, including seafood like lobster oysters, cod and eel; fowl like chickens, geese and duck; vegetables like potatoes, onions, beets, asparagus, artichokes and carrots; fruits like pears, apples, currants, grapes, even watermelon, and other foods, including a whole variety of legumes, lettuces and cabbages. The next section of the book includes recipes: roasted meats, stuffed turkey, chowders, stews, pot pies and minced pies as well as desserts like apple pie, rice pudding, Indian pudding, bread pudding, apple dumpling, puffed pastry tarts, custards and syllabub, which is a sweet custard flavored with wine or liquor. This information will be very helpful as I choose authentic meals to eat during my travels. “Tragedy in Tale of Love: What an Old Weather-Worn Peabody Gravestone Tells.” The Coquette and the Boarding School: A Norton Critical Edition. Eds. Jennifer Harris and Bryan Waterman. New York: W. W. Norton, 2013: 327-332. Print. Published first in the Boston Sunday Herald in 1902, this article is a testament to the enduring popularity of Foster’s first novel that was a best-seller in its day and for decades afterwards. The anonymous author of this article makes a compelling case for the idea that Nathanial Hawthorne used Foster’s Eliza Wharton character as a model for Hester Prynne in his magnum opus, The Scarlet Letter. My trip to Salem, and Peabody where Elizabeth Whitman is buried, will now include a trip to The Salem Custom House where Hawthorne lived and worked while he was writing The Scarlet Letter. The article also gives more in-depth biographical information about Elizabeth Whitman, the model for Eliza Wharton, than some other articles have given me, especially about her enduring religious faith and her upbringing in Hartford, Connecticut, including her father’s position as pastor of the Second Congregational Church in Hartford, which is still a functioning church (now called South Church) and one of the oldest churches in America. I’ll definitely want to visit there. Waterman, Bryan. “The Elizabeth Whitman Paper Trail.” The Coquette and the Boarding School: Norton Critical Edition. Eds. Jennifer Harris and Bryan Waterman. New York: W.W. Norton, 2013: 302-307. Print. Waterman’s name keeps cropping up in literature about Foster and Whitman. This article, first appearing in the William and Mary Quarterly in 2009, reprints several excerpts from articles about Whitman that appeared in newspapers around New England, including a notice of death appearing in the Salem Mercury and Pennsylvania Mercury, but none in Whitman’s native Connecticut. The wide interest in Whitman’s story generated brisk newspaper sales and is an example of the growing power of the newspaper. The article also contains one of Whitman’s poems written late in her life, lamenting that her lover is late in joining her as he promised. Mention is made of Foster’s high position in Hartford and New Haven societies and her death in Danvers, Massachusetts (now Peabody) at a wayside inn not long after the birth of a still born child. —. “Who Reads an Early American Book?” Common-Place: The Interactive Journal of Early American Life. 9.3 (2009). Web. 25 May 2015. 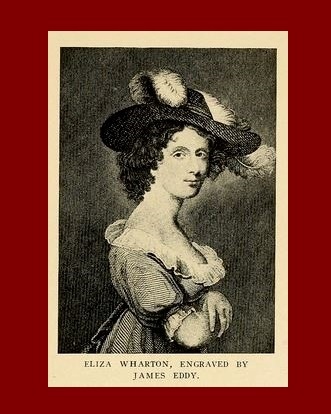 Waterman gives detailed information on the grave site of Elizabeth Whitman, the model for Foster’s Eliza Wharton in The Coquette. Explains the continuing interest in Whitman’s story—a popular and prosperous young unmarried woman from Hartford, Connecticut, who travels alone and pregnant to Danvers, Massachusetts, now Peabody, checks into the Bell Tavern, lives there until she has the baby and dies soon after. The plot of Foster’s novel follows closely the real-life situation of Whitman, so naturally I will want to include Peabody, as well as Hartford, in my travels, including, of course, the gravesite. The article also gives information about the new gravestone, next to the original, that was erected in 2004 by the Peabody Historical Society that has gone to great efforts to restore interest in the story of Whitman, her alter ego, Eliza Wharton and Foster’s novel.